Michael and I went to Seattle for a couple of days last week. We had a blast, but when we got home, I found some very, very sad cherries in my fridge. They needed to be used up, well, yesterday. They weren’t good to eat–they would have been okay for jam, maybe, but there weren’t enough of them. Hmm…. I remembered being a Starbucks recently and seeing a lemon pound cake with a raspberry ribbon. I’ve never tried it, but I thought I’d do something similar with the cherries. So, I pitted them, threw them into a saucepan with some water and some sugar, and let them cook down. When they were nice and soft, I fired them in the blender, and made a kind of jammy syrup out of them. It was quite thick, but still smooth, not sticky. 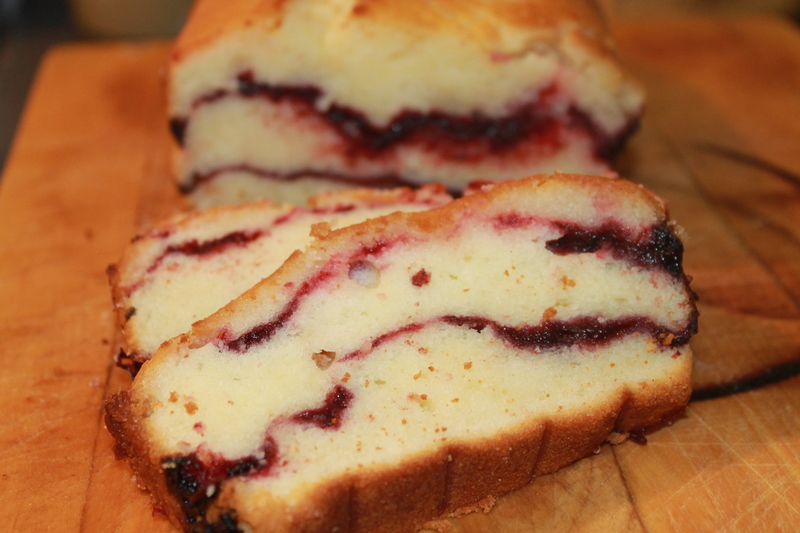 I layered the cherry jam into a lemon pound cake, and baked it up. Success! Yum! Put all the ingredients for the cherry ribbon into a small saucepan, and cook on low heat for about 20 to 30 minutes until nice and soft. Puree in a blender until smooth. Put the butter in a large bowl and cream well with an electric mixer. Add the sugar, and cream again. Add the eggs, one at a time, mixing well after each one. Add the vanilla and incorporate. In a separate bowl, combine the dry ingredients. Add to the butter/sugar mixture in batches, alternating with the lemon juice. Line a loaf pan with parchment. Put 1/3 of the batter in the bottom of the loaf pan, and smooth it out. Cover it with 1/2 of the cherry mixture. Cover with another third of the lemon batter, the second half of the cherry, and finish with the lemon cake on top. Bake in the oven at 350 degrees for at least 6o minutes, probably closer to 70, until a toothpick comes out with just a few crumbs. While the cake is still warm, take it out of the pan and peel off the parchment. Set up a cookie sheet with a wire cooling rack on top, and put the cake on the wire cooling rack. Mix the sugar and lemon juice together until the sugar is dissolved. Take a toothpick and poke holes in the top of the cake. Using a pastry brush, brush the glaze all over the top of the cake, allowing it to sink in. When cooled enough, slice and serve.